Exiled Nicaraguan journalist and Rey de Espana prize winner Wilfredo Miranda in Doral this week. 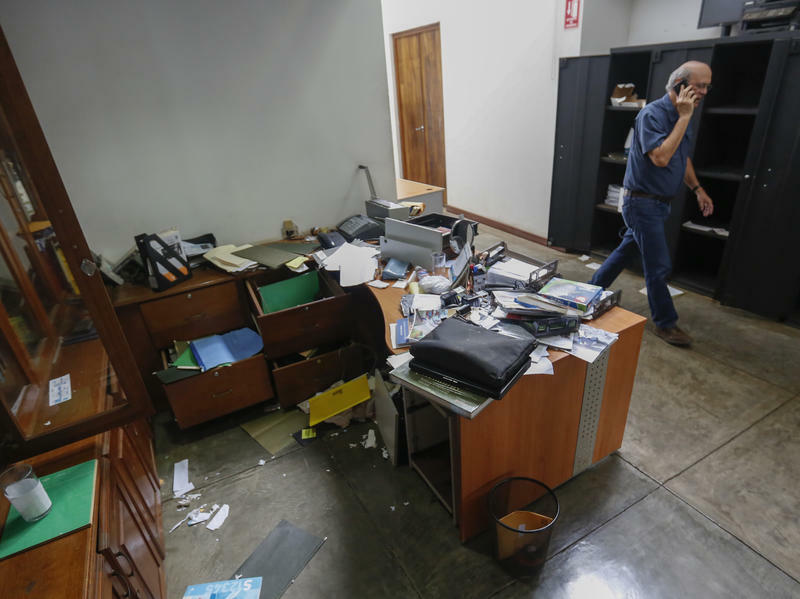 There is another political crisis raging in Latin America besides Venezuela. That’s Nicaragua, where the authoritarian regime has all but criminalized independent journalism. But one Nicaraguan journalist exiled in Miami has won a measure of revenge. Human rights groups say Nicaraguan President Daniel Ortega’s security forces have killed more than 300 protesters demanding his removal. The regime has also attacked the media – ransacking newspapers and radio stations and jailing journalists. (One was killed last spring during anti-government demonstrations.) Scores of them have been forced into exile. “I was able to document close-range bullet wounds to the heads and throats of protesters that could only be execution-style shots,” Miranda told WLRN. But during that interview on Wednesday, Miranda received an email informing him that his work had won a Rey de España prize. (The formal announcement was made Thursday.) It’s one of the most prestigious journalism awards in Spain and Latin America –and for Miranda and countless other Nicaraguan journalists it’s potent vindication. Nicaraguan journalist Wilfredo Miranda interviewing a witness to police repression in Masaya, Nicaragua, last summer. Miranda said he wanted to dedicate his Rey de España prize – awarded by a jury in Spain – to imprisoned Nicaraguan journalists Miguel Mora and Lucía Pineda, who face terrorism charges that human rights groups call absurd.